CAN we please say, once and for all, that the Medieval method of punishment below are NOT called stocks. realise with Nantwich Museum in the background, this stands in PILLORY Street. So, yes, it is a pillory. Not for the first time, this faux pas was made by two sources that you would expect to be on the ball. In its June 26 edition, a local freebie newspaper, The Crewe and Nantwich Guardian, had a reader's picture of the Cocoa Yard (to the left of the Museum) seen through the central hole in the pillory. presenter?) telling visitors to the event: "Go to the stocks in Pillory Street where you will find the Scouts." From the confident way she made the statement I'm sure she was convinced of the correctness of her comment. These are two of those situations where if enough people say something it becomes accepted as correct. THE same is true of the location in the newspaper's picture, the Cocoa House. Signs at both ends of this area confidently declare the name Cocoa Yard, whereas I have always known it as the Cocoa House Yard. 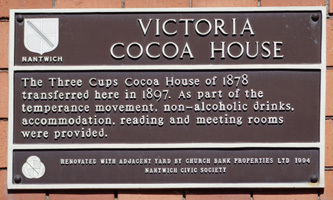 As a plaque on a wall at the Pillory Street end of the Cocoa House Yard (below) tells passers-by, the red-brick building (not the Museum) was originally a Victorian Cocoa House called The Three Cups Cocoa house, built in 1878 but transferred to Pillory Street in 1897. A plaque erected by Nantwich Civic Society says: "As part of the temperance movement, non-alcoholic drinks, accommodation, reading and meeting rooms were provided". Cocoa isn't specified but why else call it that? The plaque, which refers to the building, adds: "Renovated with adjacent yard by Church Bank Properties Ltd."
My earliest recollections of the yard was where the local ambulance service garaged their emergency vehicles. Of course, officially or not, it was called the Ambulance Yard. With both Pillory Street and Hospital Street, at the opposite end of the yard, being one-way streets - fortunately in opposite directions - the ambulance personnel had a choice of exits depending on in which direction the emergency was situated. THEN again, someone I would have expected to be an expert on the names of ancient artefacts, confidentially declared that both names can be used for either object! And my dictionary is no better. After correctly (!) 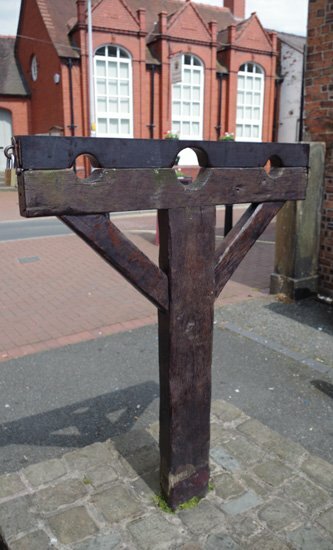 saying that a pillory was an "historical wooden frame in which offenders were locked by the neck and wrists", it stated that stocks were a frame "with holes in which the feet, hands or head of an offender were locked." I can only think they meant different types of stocks were of different designs and with different size holes. THE Nantwich Chronicle of July 9 had a report of the new Summer Fete held in the town centre on June 28. The report refers to "wet sponge throwing in the Pillory Street stocks!" The paper's exclamation mark, not mine. The report also says that events at the Fete took place "on the green in front of St Mary's Church". were rained off and so didn't take place on "the Church Lawns" as event publicity described them. 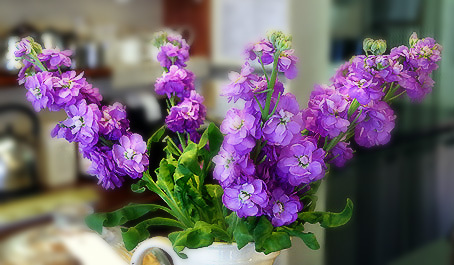 picnicing on the area in the summer. Chronicle had a picture taken at the summer fair at Sound Primary School showing a school governor facing wet sponges while imprisoned in a cross between a pillory and stocks. That is, his head and wrists are pinioned in three holes in a two-piece crossbar supported by two end posts rather than the central post of a pillory. That structure is described as "wet sponge stocks". Could this be the correct name in the circumstances? THE pillory is used as part of the annual Holly Holy Day commemoration of the 1644 Battle of Nantwich in the First English Civil War (which also remembers those who died in the war and subsequent conflicts). The local amateur dramatics group, Nantwich Players, stage a short trial scene from which an offender is marched to the pillory by a contingent of Parliamentarian soldiers provided by the Sealed Knot battle re-enactment organisation. Cabbage leaves provided by a local greengrocer are thrown at the hapless victim in the pillory. The pilloried miscreant used to be one of the actors - the accused in the mini drama - but in recent years a twist in the tail involves one of the Sealed Knot members spending time in the pillory for having let the guilty local escape! lThe stocks pictured above are in St Wilfrid's Church, Grappenhall, near Warrington, Cheshire. The lighter wood is a stand to display the stocks. However, the stocks below WERE in Pillory Street - in Molly's Tea Shoppe!